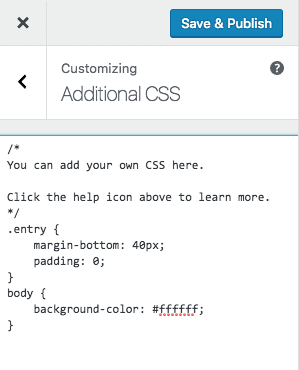 WordPress now offers editing of custom CSS through the “Additional CSS” tool. This is available through the Customize too. You can add your own Cascading Styles (CSS) to any theme you are using on UCI Sites . While it is not possible to edit one of the shared themes, if you know how to write CSS you can make changes to the appearance of your site using this tool. The Customize options lets you see the changes in real time before committing to them. Click Save & Publish to save your changes. Note: You may want to keep a backup copy of your CSS. Simply copy and paste the code into a text editor and keep locally on your computer. If you ever lose your custom code, you can paste it back in.